Peace College was founded as Peace Institute in Raleigh in 1857 by the Presbyterian Synod of North Carolina. It was named for a significant benefactor, William Peace, an elder at Raleigh's First Presbyterian Church who contributed $10,000 and land for the college. The Civil War delayed the opening of the school and completion of its original edifice, Main Building. The unfinished building served as a Confederate hospital during the war and as an office of the U.S. government's Freedmen's Bureau afterward. Finally in 1872, Peace Institute was opened, and Main Building received students for the first time. The school was a pioneer in several areas of instruction. In 1875 it established the South's first school of art and painting. By 1880 it was operating the South's first kindergarten and the region's first school of cooking. 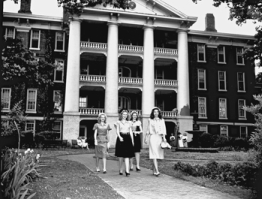 Though offering instruction for women of various ages for much of its history, by 1969 the school had evolved into a two-year junior college and awarded associate of arts degrees. In 1995 the college moved to baccalaureate status and began offering four-year degrees. There have been several variations of the official college name, but it has been known as Peace College since 1943. Throughout its history, Peace has been controlled by individuals or groups closely associated with the Presbyterian Church. The modern school is governed by an independent board of trustees but remains affiliated with the Presbyterian Church (U.S.A.) and the Raleigh First Presbyterian Church. However, students from all church denominations are welcome. The school, which is noted for its liberal arts and sciences instruction, remains exclusively female and occupies the original site. Enrollment in the early 2000s stood at about 700. The 15-acre campus near the State Capitol has won state and national recognition for its attractively designed landscape. In 2011, Peace College's Board of Trustees renamed the college as William Peace University and voted to transition to a coeducational institution. The first male students in the day program enrolled during the 2012-13 school year. Is good that there is Peace University in the worldwide, I and Wold like to opening it in the South Sudan, especially in Northern Liech State - Bentiu collaboration with Peace University.